Rental prices vary based upon the unit being rented and the duration of the trip. For accurate pricing please view www.midlandtrailerrentals.com or talk to a rental agent about Rental pricing and availability at 989-631-1231. What constitutes a "Rental Day"? A rental "day" is from the day of pick-up (after 3:00 p.m.) to the following day at 11:00 a.m. Rental payment is received via credit card and can be processed online or in the store with an agent at the time of pick up. If booking a reservation in advance a payment plan can be set up so the balance is paid in full by time of pick up. Credit card is required for insurance purposes. Reservations can be made by calling the store and speaking with a rental agent, or you may submit a quote online. If you would like to see the floor plans available or are looking after store hours, a reservation request can be submitted by visiting www.midlandtrailerrentals.com. A rental agent will contact you within 24 business hours to confirm the details of the reservation. Reservations will be taken on a first come, first serve basis. Reservations are not finalized until speaking with a rental agent and a deposit is secured. What happens if the unit I rented is unavailable? Midland RV reserves the right to change rental units at any time for any reason. In the event that a unit is for example, damaged or does not return on time, a unit of equal size and feature will be provided. What if the unit I want is not available? How do I make a reservation if there is no availability for when I want to go? Some weekends may be in high demand and already be booked. Please contact a rental agent or submit a request to be placed on a wait-list. This allows you to be first available if a cancellation arrives and helps Midland RV should expand their rental fleet. Can I make changes to my reservation once it is confirmed? If changes need to be made for the reservation a request can be sent by sending an e-mail through our online rental platform or by calling an agent. Changes can only be made if the unit is not already booked for your new dates, if this occurs and the unit is not available we will do our best to accommodate you which may result in putting you in a different unit. Any reservation canceled prior to 30 days of the reservation will have a $20 processing fee. Any unit canceled within 30 days of the rental will forfeit the reservation deposit unless the unit is re-rented. In the event that a renter does not show-up and does not call to cancel the reservation, the full amount of the rental will be charged. Our rental fleet ranges from small pop-ups of 1,800 lbs to 33' travel trailers at 7,600 lbs. How many can the rental sleep? The sleeping capacity varies depending upon the layout selected and size of the people. Typically, units can sleep anywhere from 3-10 individuals. Unit specifications are provided with each model when viewing the lay-out online and pictures are provided. It is up to the renter to determine if a unit can comfortably accommodate their party. For example: two small children may sleep comfortably on a jack-knife sofa where as one tall adult may not find it comfortable. Where can we take it? 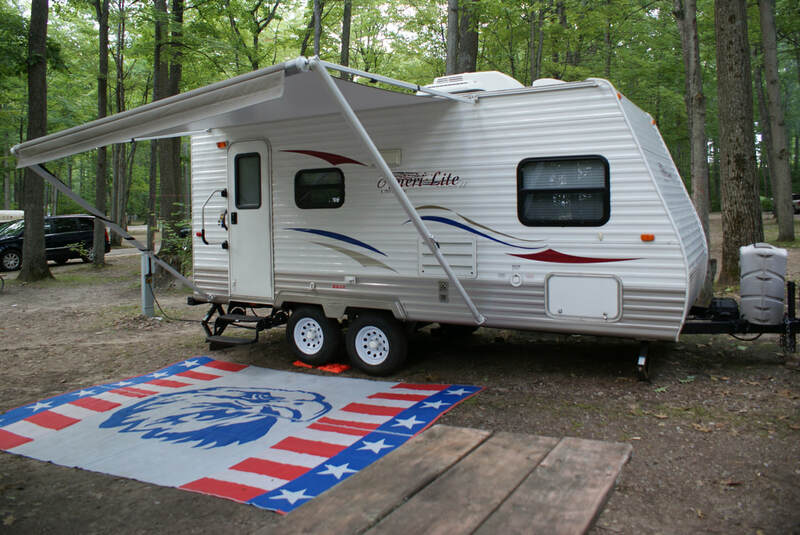 Midland RV has no requirements or restrictions as to where the customer chooses to camp. We simply ask that the unit be returned within the time frame requested by the renter as to not delay other customer's vacations. If traveling further distances, please take into consideration any delays that may occur. ​Is there any other charges besides the cost of the Rental? Yes. There is a $6.00 charge for RV Toilet paper. Non RV toilet paper can clog the tank causing the septic system not to dump. The cost of the rental includes the number of days a customer has requested as well as patio-mat, fresh water hose, water regulator, 25' extension cord (in addition to 25' on the coach), leveling blocks, wheel chalks,10' sewer hose for dumping, and cleaning supplies. Additional charges will be made only if the customer requests. Can you accommodate customer with special needs? If special accommodations are required please contact a rental agent directly. Although our units are not equipped with electric lifts for wheel chairs, our trained agents can assist you in selecting a floor plan that would best accommodate your family. What type of vehicle do I need to tow a trailer? Many vehicles are equipped to tow travel trailers ranging from mini-vans to trucks. Our smallest trailers require a minimum tow capacity of 3,500 lbs. You can find your vehicles towing capacity in your owners manual. ​What do I need to be able to tow unit? Folding Trailers - A minimum of a 1" hitch receiver, flat 4 electrical wiring and a 2" ball with ball mount is required to rent a folding trailer. Delivery services are available. To calculate the cost of delivery, Midland RV calculates the mileage from our store front (607 S. Saginaw Rd., Midland, MI 48640) to the final delivery destination of the Renter. The number of mileage is then multiplied by $2.50. This formula was based upon the time and gas required to make the delivery (to location and return) with set-up and pick-up (to location and return) tear down and dumping of unit. EXAMPLE: Alpena Mi. is approximately 151 miles from our store location. Delivery of unit, set-up, pick-up and emptying of tanks would be as follows. 151 x $2.50 = $377.50 delivery fee $377.50. Is there a charge for miles? Midland RV does not charge mileage for travel trailers or folding trailers as they do not have engines to maintain. The only mileage charge is in the event that a renter has requested delivery. Why is a deposit required and will I get my deposit back? The deposit is required to be on credit card. In the event that the unit is not returned on-time, is returned damaged or without being dumped part of the deposit will be withheld. There will be a $25.00 sterilization fee withheld from security deposit, all other charges will be assessed individually. Is there any coverage with Rentals? We have minimal Ins. coverage on our rental units with a $500.00 deductible. We encourage you check with your your auto insurance to see if covered on your policy or could purchase through them, if not we do offer additional insurance you can purchase. When can I pick up my rental unit? Units are to be picked up after 3:00 p.m. and returned by 11:00 a.m. This allows for the rental unit to be checked in, cleaned and sterilized, as well as regularly maintained. The week prior to a scheduled reservation, the renter will be contacted by a rental agent to confirm a time for pick-up. Although an early and safe return of the unit is appreciated, no credit will be granted for the early return. Why? Because the unit was blocked off as "rented" therefore the unit was unable to be re-rented out. What if I am late returning? A customer returning late will receive a $50 late fee charge. If the unit is not returned by 3:00 p.m. the customer will be charged for an additional day. We understand that from time to time a customer may return late due to unexpected back-ups in traffic. In the event that a customer is running late, contact a rental agent to notify of the expected delay as soon as possible. This will allow an agent to make needed adjustment to scheduling. What time is delivery and pick-up if my rental is being delivered? When a unit is scheduled for a delivery, the delivery can be expected to leave the store location no sooner than 3:00 p.m. and will need to be picked-up to be returned to the store by 11:00 a.m. the same as if the unit where being scheduled to be picked up. Are the times set in stone? Yes, exceptions are rarely made. All campgrounds have a designated check-in and check-out time. Our delivery schedule allows time for the unit to be checked in and go back out on the same day as well as allows for the most efficient delivery of the rental units since our driving staff will not wait in long check-in lines. Midland RV is a pet friendly facility; however, we ask pet parents to be respectful of customers who may have allergies. Evidence of pets will result in an additional $30 cleaning fee. If your pets may damage the unit due to anxiety, ask for a unit that can accommodate a kennel/crate. If your pets like a cozy window view and may curl up on the sofa, simply covering the sofa with a sheet is often enough to protect from pet dander. Where can we empty holding tanks? Most camp sites have a dump station when exiting the park. Some campsites may have direct hook-up on the lot. In the event that there is not a place to dump where you are camping, the city of midland has a dump station or the unit can be dumped at the Midland Fairgrounds for $5.00. If you are unable to dump, please notify a rental agent so the unit can be taken to be dumped for the next customer. A $25.00 charge will be applied. If you are uncertain of how to dump the unit, please see our "Renter's Reference Manual" inside the unit. Additional equipment is available for rent if a full hook-up site is reserved. What happens if something on my unit breaks? Please notify the rental agent or leave a list in the unit. This helps Midland RV keep their rental fleet in top condition and provide timely turn around. We understand that some damage may be to natural wear and tear of the unit. In the event that something breaks due to user error, Midland RV works with the customer to find the most economical fix. How do I learn to operate components? At the time of pick-up the renter will be provided with a brief rental video for their unit that can be referenced online while camping. The customer will also receive a walk-thru from a rental agent. Can I get a copy of the rental agreement in advance? Yes. Midland RV can e-mail a copy of the rental agreement at the time the reservation is booked. If the renter does not have e-mail a hard copy can be provided. Are the systems in rentals capable of handling medical equipment? If special needs are required please check with a rental agent to confirm that your personal needs can be met. For example, several units have 110 outlets next to the bed to accommodate CPAP equipment.